What can you possibly accomplish in just four minutes on the bike? A lot, actually. All you have to do is ride as hard as you can. Better yet, instead of riding as hard as you can for four straight minutes, ride at your true maximum power-output level in several short bursts, resting just long enough between bursts to avoid a precipitous decline in power output from one burst to the next. The session I just described is known as the Tabata protocol. It is named after Izumi Tabata, Ph.D., a former researcher at Japan's National Institute of Fitness and Sports in Kanoya, who learned about the workout from the coach of the Japanese national speed-skating team. Tabata's primary research interest was the effects of exercise intensity on fitness. Through his work he came to believe that exercise intensity was at least as important as, if not more important than, exercise duration. So when he heard about a workout that packed two minutes and 40 seconds of maximum-intensity work into a four-minute period (and that's for those who could do eight intervals), he was intrigued. To test the effects of this workout, Tabata first transferred it from speed skating to stationary bikes. Then he recruited subjects and had them perform the protocol five times a week for six weeks. At the beginning and again at the end of the study period, Tabata and his team measured the subjects' VO2 max and their anaerobic capacity. 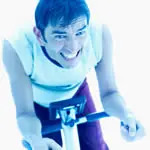 To provide a basis for comparison, Tabata conducted a second experiment in which subjects pedaled stationary bikes for one hour at a moderate intensity (70 percent of VO2 max) five days a week for six weeks. Their VO2 max and anaerobic capacity were also measured before and after the intervention. If you're like a lot of triathletes, you will be tempted to incorporate this session into a longer workout. Don't. If you do more than a warm-up beforehand, you will fall apart completely after just a few intervals, and while you will still be giving a maximum effort, you will not be working at your true maximum output level, and that's what counts. And you simply won't be able to even think about doing anything more than a short cool-down after completing your Tabata intervals. There are two approaches you can take to incorporating the Tabata protocol into your regular training. One option is to do the session regularly—from once every 10 days to as often as twice a week—during the base-building period of training to quickly and efficiently boost your aerobic and anaerobic fitness. Continue to do the session regularly until your performance (i.e. your maximum total distance covered) within the session stops increasing and levels off, and then turn your focus to more race-specific types of high-intensity workouts. Henceforth just do the session whenever you feel the need for a good blast. A second option is to use the Tabata protocol primarily as a time-saver. Whenever you're pressed for time but you still want to get the fitness benefits of a solid workout, toss in a Tabata and have it both ways. Download the ACTIVEx app, the world's first community-based fitness app. The app features customizable Tabata-based interval workouts and group training experiences with in-app coaching. You can create and find "packs" to play with, download training plans for 5Ks, 10Ks and more, and celebrate your successes with friends and family.